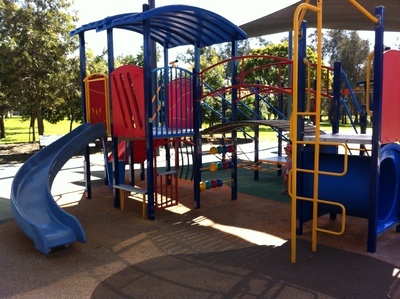 Located along Meadowlands Rd at Carindale is the recently refurbished Minnippi Parklands playground. This southern section of the Minnippi Parkland (the northern section is host to the wetlands and has a variety of ducks and canoe trails) has a wonderful playground ideal for toddlers. The brightly coloured traditional and modern playground equipment is shared between two shaded play areas. Musical instruments for the little virtuoso, a flying fox for the thrill seeker and a multitude of spinning toys to be sat on, sat in, lied down on and stood on showcase the council's latest designs. The traditional favorites of play windows, a twirly slippery slide and swings are set amongst these new generation style of playground equipment. The music corner consists of 5 timpani style drums which stand next to a vertical, large scale xylophone. 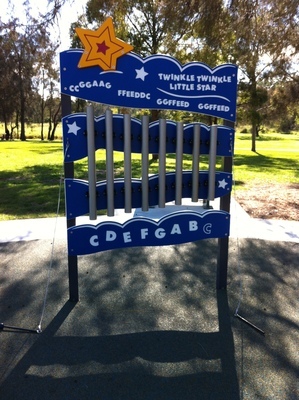 The notes are well displayed on the large xylophone and above the keys they have thoughtfully included how to play Twinkle Twinkle Little Star. Subtle safety additions such as soft rubber flooring beneath the equipment and swings with ultra-safe high backs and H-style harnesses ensure your little one's safety without ruining their fun. While these shaded playgrounds are designed for toddlers, the adjacent basketball court, half-pipe, large grassy areas and well established bike tracks provide options for older children. For families with a canine member, the neighboring dog off leash area can provide the perfect outlet for their energy. Combine these with BBQs, plenty of undercover picnic tables and a well shaded parking lot, creates a wonderful space for your family to enjoy some time together.